History was never my strongest curriculum area. It was just list after list of names, places, and dates that tended to jumble together as the lists grew. Nothing was ever "alive" enough for me to gain an actual understanding of the events--what happened, who was involved, and, most importantly, why things happened. Steve Sheinkin has changed that, first with King George: What Was His Problem? and now with Two Miserable Presidents. Combining historical fact with little-known anecdotes, quotes from letters and journals, and bits of trivia, he has--for me, at least--caused Civil War names to evolve into actual personalities, turned the places into more than background scenery, and changed a list of "events leading to the Civil War" into "ohhh, that makes sense, now I get it." And trust me, that is quite the accomplishment. I would finish a chapter, then look at my husband and ask, "Did you know that more Americans died in the one-day Battle of Antietam than have died on any day in history before or since? Did you know the Emancipation Proclamation didn't actually free anyone? Do you know why Southerners hate William Tecumseh Sherman with a white-hot, passionate hatred?" Because I didn't know those things. You probably do, but I didn't. Now, if I, as class Valedictorian (huzzah, huzzah) can struggle with understanding major American history events like the Civil War, it is possible that some of our students today struggle as well. They need someone to help them genuinely understand that history if they're really going to learn it. Sheinkin's collection should be placed firmly in the hands of every Social Studies and History teacher. And if you know a kid (from age 9 to 99) who is studying the Civil War, buy him or her this book. Read through it with him; you'll both enjoy it. Some of the stories are humorous, some heartbreaking, but all memorable. And with every page you turn, your student's understanding will grow. "History--with the good bits put back! "The author's website describes these books as "guaranteed-never-boring history books, packed with all the true stories and real quotes he was never allowed to use during his career as a textbook writer." Despite the comical look of the series, Sheinkin includes a serious historical overview of the war, which highlights all the key events leading up to the war, from the Fugitive Slave Act to John Brown, the Dred Scott decision, and the Lincoln-Douglas debates, among others, as well as the key events of the war itself. Like Ken Burns, Sheinkin includes many anecdotes from ordinary citizens, as well as highlighting lesser-known participants such as Rose O'Neal Greenhow, a Confederate spy known as the Wild Rose of Washington. Sheinkin does not forget to profile some of the famous colorful personalities of the war, who continue to fascinate us, such as Stonewall Jackson, Robert E. Lee, Jefferson Davis, George McClellan, Ulysses S. Grant, and of course, Lincoln. Did you know Lincoln was a terrific wrestler? The author also provides plenty of details on ordinary life for soldiers, especially how hungry they were. Sheinkin's book ends with Lincoln's assassination, but he provides an excellent "What Ever Happened to" appendix which provides follow-up information on key personalities who appear in his book. He also provides a bibliography of many of the sources he used, which is divided into specific categories including general books on the war, biographies of major Civil War figures, books about everyday life during the war, books on specific battles, memoirs by Civil War personalities, and more. I highly recommend this book for young readers, not only those who enjoy history but more importantly for those who think history is boring; unfortunately, this is an attitude which is not surprising given how dry our history textbooks for young people are. It even makes a great review of the Civil War for adults who want to brush up on this fascinating period of our history. It's really clear here that Sheinkin was a textbook writer - not that this is dry, but that it is written in an almost dispassionate, just-the-facts way. And I'd take issue with the "Everything Your Schoolbooks Didn't Tell You" subtitle. Nothing here is new to me - but it is presented in a coherent, comprehensive way. It's not especially deep, but it does touch on almost every event. That's what's most impressive. This book was absolutely amazing with its fun facts about the Civil War! The genre of this book is historical fiction (obviously). *SPOILER ALERT* The book begins before the Civil War with the Preston Brooks almost beginning to hit Charles Summer. Why? Well Charles Summer was the man who did rip the country apart with the Civil War. The book gives a thirteen step guide to how tear the country apart. Step one: Plant cotton. This step shows how Eli Whitney had his big chance to met Catherine Greene who owns a plantation in Georgia. The reason Eli Whitney wants the Plantation because the best way to make money is to sell cotton and lots of cotton!Step 2: Grow apart. In this step is based on the North gradually getting ride of slavery because the north believed it was wrong. Most people could not afford slaves with there small farms so they got rid of the slavery.The southern states were all about cotton and Tabasco so they got rid of slaves because they believed people would like to by things naturally grown by them only instead of enforcing slavery. Need less to say people did not by there products and it was a bust. Step 3: Keep your balance, Meaning the North and the South are puling apart and are going back and forth on slavery so there fighting vigorously this is dividing them in slave nations. Step 4: Fight Slavery, after hearing the states going back and forth on the issue a man named Fredrick Douglass was at the time eighteen decided to stand up for himself a speak up instead he got beat by his owner as white men watched. He filed a claim but it was denied because he was a slave so he had no word of assault. Henry Douglas later got the papers and had his case solved resulting in the state having to end slavery for good.The Election day of 1864 a life or dead moment were Abraham walked down to the White House To meet his competitor Gorge McClellan (Democrat) Who lost with the ballot vote of 21 to Abraham with 212 Wow! McClellan did not even have a close tie or anything. He truly lost the votes and not are dear Abraham is the 5th president of the U.S.A Later on the states still frighted so they deiced it was war time and resulted in well the Civil war with there current senior at hand it was a sure lose so they turned to President Lincoln who saved us from the over 10,000 battles that the Civil war lead to. After the whole war they faced Abraham Lincoln saved the union and ended slavery all together. Abraham Lincoln saved us all and ended the Civil War for good.I give this book a 4-5 because of the amazing story and the history behind it. I would recommend this book to everyone it was amazing and I love it and I hope others will to. The author used to write textbooks, and was frustrated by the dry style of writing that he was required to use. So he saved all the unusual, funny, amazing, and surprising stories and quotes that he couldn't use in textbooks, and wrote his own highly readable book about the Civil War. The two presidents were Abraham Lincoln and Jefferson Davis, who was the president of the Confederate States. But the stories aren't so much about them as they are about the men, boys, and even a few women who fought in the war. From spies to stinky socks to picnics on hills overlooking battlegrounds, these are stories you've never heard before. Written for ages 9-14, this slim volume is a thoroughly entertaining look at the human side of the Civil War. There are no footnotes, but in the back the author has listed attributions for all the quotes he used. A valuable addition to a U.S. History class, and entertaining for all ages. The doctor checked this out for SkyGirl because she got Battle Cry, a Civil War board game, for Christmas. She, SkyGirl, wanted to know more about the Civil War. I started reading it and it was great. For a quick review of all the important battles and events around the Civil War. And it's humorous, clever and well-written. This is a much easier and fun way to learn about the Civil War than just reading a boring, old, textbook. READ IT! 6/27/13: Excellent! Completely changed the way I picture the Civil War. Made the hunger, foul food, and diversity of representation much more real to me. Two Miserable presidents is definitely one of the most entertaining history books I have ever read. I usually don’t enjoy reading long history books because they often contain pieces of info that are most certainly relevant however are extremely boring and doesn’t make me want to remember it and I usually forget. However this book changed that perspective. There were so many little details such as what a person’s nickname was and the funny backstory behind it or the funny pictures that portrayed a person in history. These little things separated this book from others and I remembered a lot of the pieces of history that the author mentioned. The book starts off with an interesting act that someone did in history that was violent. It described Preston Brooks attacking Charles Sumner with a cane and beating him. I didn’t expect that because most history books go with general boring info with almost no stories that draw the reader in. This fact jumped out at me and I kept on reading. The book then proceeds to explain why he was beating the gentleman with his extremely hard cane. The first piece of info was the backstory behind Eli Whitney. I’m mentioning this specific thing because in textbooks all they mention is that he invented the cotton gin and caused a huge boom in buying slaves because southerners were growing cotton. What I appreciate is that the author told the story behind him and how he became an inventor. The little interesting backstories put this book on a different level and made me have a deeper understanding and that helps a lot.Then the key things in the book start to appear. The book dives into how the north and the south were splitting apart and go through examples. Many of the reasons that the north and south were splitting apart in addition to being given were thoroughly explained and there were stories sprinkled here and there so it didn’t feel like a research paper. The flow of this book made me feel like the author was actually speaking to me. The book talks about how the north and south lifestyles were different and that while the north was industrious and didn’t need slaves the south was focusing on agriculture and never made any big technological advances and their whole lifestyle was around growing crops and slavery was needed here. The opinions between a northerner and southerner were on opposite sides and this often led to arguments. The next part is about the compromises and the balance free and pro-slavery states. They talk about the Missouri compromise and how certain states such as California wanted to enter as a free state and how southerners were voting against it. Also it shines light on the southerner’s fear of slaves being free because the north had a larger population and could vote without their support and this is when they started to consider seceding. There were also many problems regarding abolition and the people fighting for that. There were many ways abolitionist tried to end slavery such as writing books like Uncle Tom’s Cabin, give speeches about slavery, and in some cases they resorted to violence. One thing I like about this book is that it sometimes gets off track but in a good way so we can see deeper into the book and goes into the underground railroad rather than the civil war but it still is related because south slave owners were angry about the underground railroad and it was a cause of why the south seceded. Then the book comes back to when Brooks was attacking Sumner. The interesting part is that the author mentions things like people sent him canes with messages saying to beat him again.The book is essentially a history book but with an incredible amount of stories. John Brown was described as a crazy man in a textbook but in this book he is painted as a delusional man with extremely serious issues such as being sued many times, having 20 kids, and essentially what I believe starting the civil war. He cut open people’s head to make a point and this was a huge thing and southerners were outraged. This part of the book goes through some key points in abolition and talks about Dred Scott and the northerner’s fears about slavery being legalized. Now the book goes into chronological mode and talks about Lincoln and his election and his debates against slavery. During this time the one part that stood out the most was that Abe’s trademark beard was created when a little girl requested him to. The book after Lincoln talks about the civil war and how sad it was. The book goes through battles and tough times that both sides had to endure. In between the bloody battles are some short stories such as a man only getting half of his hair cut and others. Finally the book talks about Lincoln’s assassination and then gives stories of the future of the people mentioned in the book. They’re fun and quirky and give us room to imagine what happened to the spies after the war was over, were people ok and did they live. Most of our questions and small thoughts are answered in this part and I appreciate that the author took the time to research these things and it’s evident that a lot of hard work was put into it.The book was great and I would definitely recommend it to someone who enjoys history but hates boring things. The book was enjoyable and educational at the same time and I liked the book’s stories and quotes and other things that textbooks don’t have. The book does have some bloody inappropriate times however everything else is fine and this book can be read by young readers because it’s pretty easy to understand. Nice job Steve Sheinkin and thank you for the good book. History with the good bits puts back in indeed. So I'm not a big history buff. Keeping track of names and dates and places and dates and names was...never very interesting to me. This made it tolerable -- I actually finished reading this -- which to me says quite a lot. I think it's a good target for any kid 4th grade and up. And if you actually like history? All the better. An excellent & well-written examination of the American Civil War. The two presidents are Abraham Lincoln and Robert E. Lee. Robert Lee seemed liked kind of a nice man, who was very serious and didn't want his soldiers messing around. He was very devoted to the South. Some Generals were fighting to keep slavery, and some generals were fighting to leave the united states. I think Lee was more interested in leaving the United States than he was in keeping slavery. Lee like to be directly involved and in charge. Lincoln was kind of both anti-slavery and also trying to keep the United States together, but keeping the US together was more important to him. Lincoln trusted the people around him that he appointed to do a good job. I'd like to hang out with Lincoln. He was smart, brave and knew who trust. I could learn to ignore the people who bother me, because he learned to ignore the people who didn't appreciate him or thought his ideas were bad. The book starts just before the Battle of Ft. Sumpter. It ends with Lincoln's death. Most of the story takes place during the Civil War and the battles. The author doesn't spend a lot of time talking about the location because he spends his time talking about ideas and strategies. The setting is really what's happening in their minds.The conflict is territory — both North and South, slave and free. The book talks about the causes of and things that happened in the Civil War. The book tells the stories of famous people and some people you've never even heard of.It also included a "whatever happened to" section which was content about some of the people mentioned in the book. He describes how their lives went after the Civil War. I felt like it was pretty useful and cool because I liked knowing what those people did after the War. Some of them I wondered about while I was reading the book. I wondered what would happen to the southern people and he tells us.I would recommend this book to someone who is interested in going deep into the Civil War. He includes some funny parts and suspenseful parts, so it never gets boring or scary. A great book that can captivate anyone. I reread it for the 10th time. The stories provide the backbone for history. "Two Miserable Presidents" is a very interesting take on a history book. As the title states, it strives to provide "everything your schoolbooks didn't tell you about the Civil War," and I believe it did accomplish that. Let's get into the book. I'm not one who loves to read textbooks, hence why the idea of this book interested me. I wouldn't say that I loved this book, but I certainly believed it was much better than having to read the average textbook. What textbooks fail to do (in my personal opinion) is keep you engaged; they attempt to throw in too many facts in a handful of pages and the result is often overwhelming. This book, in my personal opinion, wasn't. It was generally more engaging, and thus I remembered more facts, information, names, etc. "So Preston Brooks's metal tipped cane is about to land on a senator's head. Interesting. But before that cane can actually crash onto Charles Sumner's skull, let's step back and take a look at the events leading up to this moment. "This was part of the opening paragraph of this book; what an interesting style of writing for a history book. I loved how Steve Sheinkin was able to bring to life multiple figures from the war into one book. I've been reading Civil War books on individual war heroes for some time now, and it's been nice to see them all come together into one large telling of the Civil War.All in all, I would say that I rate this book 3 stars; if you're looking to learn about the Civil War but you're not interested in textbooks, give this book a try. There are many good books available which give an overall view of the Civil War. This book takes a different approach by showing us the war through the lives of individual people. Many of the events were new to me, such as the women's revolts in Atlanta and Richmond. Food was extremely scarce. Merchants demanded exorbitant prices and families were starving. Southern women with knives and axes marched through the streets demanding fair prices from the merchants. If they felt the prices were unfairly high, they would each grab a loaf of bread or other goods and take home to feed their families. The women's riots in Richmond became so violent that President Jefferson Davis ran into the street, jumped up on a wagon and pleaded with them to go home, pulling coins from his pockets to toss into the crowd. When his plea failed, Confederate troops had to be called in before the women went home. Stories such as this fill the book.The maps in the text were very helpful, but I felt that the cartoon-like illustrations detracted from the extensive research that the author had invested into producing this work. Perhaps they would make it more enjoyable for young readers, however.Overall, a very good book. I look forward to reading more from this author. In a forward to this book, the author explains that he once wrote textbooks and he knows why they are so boring--they leave all the good stuff out! As far as quotes go, they avoid any "that are at all funny, amazing, surprising, disgusting, confusing, stupid, mean, or anything else interesting." So in this book, he puts in all the stuff that textbooks leave out.The two miserable presidents of the title are, of course, Abraham Lincoln and Jefferson Davis, but the book includes many more people than just those two. It is a very readable overview of the Civil War, told in short segments which focus as much on the people on the home front as it does on the soldiers and battles.There are so many books on the Civil War and--with the Lincoln bicentennial coming up--on Abraham Lincoln that you'd almost imagine that there's nothing new to say. Yet there were incidents in this book that I had not come across before. My favorite was the story John Burns, a seventy-one-year-old War of 1812 veteran who lived in Gettysburg and, when the battle started, went out with his old gun and joined up with the Seventh Wisconsin. Wounded three times, he survived the battle and met with Abraham Lincoln when he came to deliver the Gettysburg Address. I liked the first book, about the Revolutionary War, better than this one but I think it's because the Civil War is just that much more complex. I love all the quotes and how he organized his source materials so that the audience this book is intended for (juvenile readers) can understand how much research is involved and can find additional materials if they are interested. I did learn quite a bit from this book. I have vague memories of studying the Civil War and more recent ones of the romanticism of Southern belles and gallant soldiers and the audacity of Sherman. However, I liked getting, in the words of Paul Harvey, the rest of the story. It was fascinating to find out just how hated Lincoln was throughout his presidency and just how close the South came to winning the war and just how inept the Northern generals were at their jobs. It's amazing we had the outcome we did and managed to stay one country. I can't wait to see what's in store from this great author! 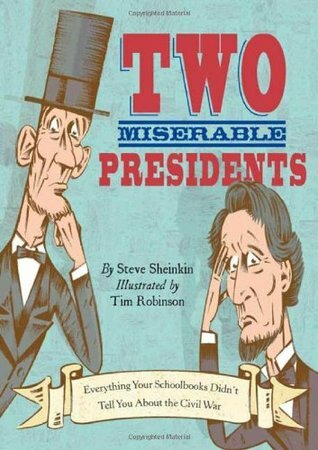 Two miserable presidents The book Two miserable presidents tells the “unknown” part of the civil war unknown being the part that isn't known by many american kids because the textbooks don't tell those things. This book has a lot of information from 1848 to 1865 for example,South Carolina's Senator Preston Brooks beat Massachusetts senator Charles Sumner on the floor of the senate with a cane in 1856 because of Sumner's speech about slavery and how a bunch of shoes led to a famous battle in Pennsylvania. plus a special section with “what happened to…” which tells what happend to the people mentioned in the book. This book is Awesome !! !, it is so deatalied and has so many interesting stories. Have a book report about the civil war ? perfectbook, 100% nonfiction ! This was a fun overview of the Civil War written for kids --- I'd say middle school age. It includes quotations and crazy stories you probably didn't learn about in school. One of my favorites is about a Union general who went up in a hot-air balloon to spy on the Confederate camp, but the tether broke and he didn't know how to control the balloon. So there he was, floating back and forth over the two camps, too high for the Confederate guns to reach him and with no way of getting down! He decided to use his time wisely and watched the Southern camp through his spyglass until he finally crash-landed into a tent -- in the Northern camp. Anyway, the book is not heavy on names and dates, but is a lot of fun to read. I'll probably check out the one about the Revolutionary War next. Benedict Arnold was checked out, so I got this instead. This is a GREAT little YA explanation of the Civil War. Many adults would understand the causes and motivations of the Civil War in a nutshell by reading this great book. I am really digging this author.Loved it. I would love for tons of my students to read this. Our library must order this if they don't have it. I am going to have to become a Sheinkin fanboy I think. Random fun fact: Jefferson Davis' widow and Ulysses Grant's widow both ended up living in New York and became good friends. They went out in public often to try and encourage reconciliation of the South and North. Steve Sheinkin Tim Robinson - From: stevesheinkin/about/I was born in Brooklyn, NY, and my family lived in Mississippi and Colorado before moving back to New York and settling in the suburbs north of New York City. As a kid my favorite books were action stories and outdoor adventures: sea stories, searches for buried treasure, sharks eating people… that kind of thing. Probably my all-time favorite was a book called Mutiny on the Bounty, a novel based on the true story of a famous mutiny aboard a British ship in the late 1700s.I went to Syracuse University and studied communications and international relations. The highlight of those years was a summer I spent in Central America, where I worked on a documentary on the streets of Nicaragua.After college I moved to Washington, D.C and worked for an environmental group called the National Audubon Society. Then, when my brother Ari graduated from college a few years later, we decided to move to Austin, Texas, and make movies together. We lived like paupers in a house with a hole in the floor where bugs crawled in. We wrote some screenplays, and in 1995 made our own feature film, a comedy called A More Perfect Union (filing pictured below), about four young guys who decide to secede from the Union and declare their rented house to be an independent nation. We were sure it was going to be a huge hit; actually we ended up deep in debt.After that I moved to Brooklyn and decided to find some way to make a living as a writer. I wrote short stories, screenplays, and worked on a comic called The Adventures of Rabbi Harvey. In 2006, after literally hundreds of rejections, my first Rabbi Harvey graphic novel was finally published.Meanwhile, I started working for an educational publishing company, just for the money. We’d hire people to write history textbooks, and they’d send in their writing, and it was my job to check facts and make little edits to clarify the text. Once in a while I was given the chance to write little pieces of textbooks, like one-page biographies or skills lessons. “Understanding Bar Graphs” was one of my early works. The editors noticed that my writing was pretty good. They started giving me less editing to do, and more writing. Gradually, I began writing chapters for textbooks, and that turned into my full-time job. All the while, I kept working on my own writing projects.In 2008 I wrote my last textbook. I walked away, and shall never return. My first non-textbook history book was King George: What Was His Problem? – full of all the stories about the American Revolution that I was never allowed to put into textbooks. But looking back, I actually feel pretty lucky to have spent all those years writing textbooks. It forced me to write every day, which is great practice. And I collected hundreds of stories that I can’t wait to tell.These days, I live with my wife, Rachel, and our two young kids in Saratoga Springs, New York. We’re right down the road from the Saratoga National Historical Park, the site of Benedict Arnold’s greatest – and last – victory in an American uniform. But that’s not why I moved here. Honestly.